HÀ NỘI — Nguyễn Phương Khánh has been crowned Miss Earth 2018. She’s the first woman from Việt Nam to win the prize since the pageant began in 2001. Khánh, 23, was born in the southern province of Bến Tre and is currently pursuing a degree in marketing at Curtin University, Singapore. Miss Earth is a pageant specifically aimed at promoting environmental issues around the world. It was screened live in a number of countries on the cable channel Fox Life in South America, Europe, Africa, North America, and the Middle East. During the final Q&A around, Khánh said the most pressing issue of the millennial generation is ignorance. “We have so many technologies, and we just use social media and only care about ourselves. We should spend our time to think and feel with what’s happening with the Earth right now. One small action multiplied by a million people can transform the world,” she said. Khánh will travel the world to promote the pageant’s advocacy of spreading environmental awareness. “In the moment of holding hands tightly with Miss Austria, I deeply hoped the name of Việt Nam would be announced because I was representing the country competing in the competition, not a singular Phương Khánh. I was overwhelmed with emotions and happiness to be crowned as the winner. As a girl from Bến Tre Province, I also wish to send this win to my hometown,” Khánh said after winning Miss Earth 2018. “I will use my recent-achieved titled and my voice to call for environmental protection,” she added. Designer Linh San, a member of the jury board, confirmed that there has been no particular favour for the Vietnamese representative and Khánh won simply because she had always been such a strong competitor since the beginning of the beauty pageant. “Khánh made me proud when she raised her voice and confidently answers the Q&A in English. Each of her step drew the attention and received much supports from the audience. Furthermore, two words ‘Việt Nam’ was constantly exclaimed from the international supporters. And finally, the room seemed to burst out when Khánh was announced as the winner,” San shared with online newspaper Zing.vn. “Therefore, this winning is totally deserving,” she added. 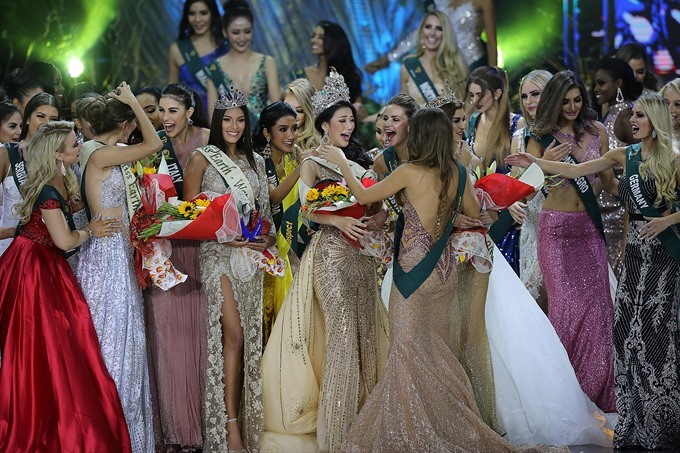 The pageant also crowned “elemental queens” — Miss Earth-Air Melaniec Mader from Austria, Miss Earth-Water Valeria Ayos from Colombia, and Miss Earth-Fire Melissa Flores from Mexico. Earlier in the beauty pageant, Khánh won a gold medal for Asia & Oceania region, a gold medal in the national costume round and a silver medal in the swimsuit round. She was the second runner-up at the Miss Sea Vietnam Global 2018 held in Phú Quốc District in the southern province of Kiên Giang in April this year.